We know that drinking water is good for our health. But did you know that water is also used externally as a powerful treatment against disease? “The earth was formless and desolate. The raging ocean that covered everything was engulfed in total darkness, and the Spirit of God was moving over the water," Genesis 1:2. Water covers 70% of the earth’s surface. Water is also the most abundant molecule in the human body. Besides oxygen, water is the number one molecule needed for all living creatures. The clear aqueous solution is called the "universal solvent" because it dissolves more substances than any other solvent. 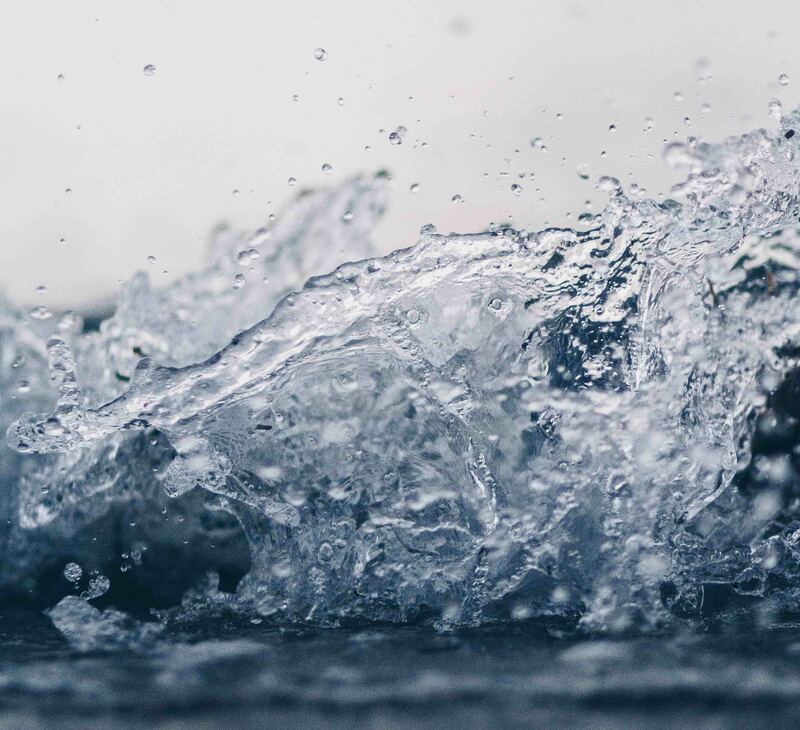 Wherever water goes, it carries dissolved minerals, nutrients, and other chemicals and it is the only natural substance that can exist in all three states of matter: solid, liquid, and gas at temperatures normally found in nature. It is no wonder then, that water is used in the Bible to represent the Word of God, a reflective pool in which we are to drink daily in order that it might dissolve sin and every defilement of the soul. Found in every tissue and organ of our body, water makes up a great amount of our blood, muscles, bones, brain, lungs, and kidneys and is vital for every bodily function. We use and lose water through breathing, sweating, digestion, and through urine (1.5 liters per day). Therefore, bathing our organs and tissues generously with water is essential to their perfect functioning. Although water cleanses, detoxifies, and sustains our organ and tissue and maintains health through various physiologic processes, modern science does not readily accept or fully understand how water also plays a key component for preventing and treating diseases. In the 19th century, Sebastien Kneipp noticed how animals would bathe their wounds and injured parts of their body in runny rivers of water. This stimulated his interest to experiment with hydrotherapy at various temperatures and pressures. However, the utilization of water for therapeutic purposes isn’t nearly a 20th-century finding. It dates back to ancient civilizations. Ancient Romans, Greeks, and Egyptians are known to have widely used hydrotherapy. Today, external applications of water to the body are known as hydrotherapy, aquatic therapy, sitz baths, and balneotherapy. These treatments can occur at different levels of the body such as the feet, hip-deep, umbilical-level, or head-out immersion. Water improves our health and induces healing by improving blood flow and heart function. Several studies have documented sustained benefits of water in various modes of applications and at different temperatures. In summary, water treatment can lower heart rate and blood pressure by altering certain hormones, such as norepinephrine and brain-natriuretic-peptide. Cold water exposure to small areas of the body causes compensatory vasodilation in the deeper vascular system, meaning increased blood flow to tissues. Furthermore, alternating cold and warm packs to small areas of the body leads to synergistic benefits of vasodilation and improved blood flow to the injured area. In another study, warm water treatments with sauna-therapy were shown to increases vascular nitric oxide, a chemical which dilates blood vessel walls, improves blood flow. In patients with known coronary heart disease, rapidly alternating cool bathing and hot saunas can lead to severe blood vessel spasms, leading to plaque rupture or thrombosis of a heart vessel. Therefore, extreme temperature changes should be avoided in high-risk patients. Lastly, water heals by improving and reducing a patient's state of pain. Studies show labor pains markedly reduced in patients using an immersion bath versus traditional hospital beds. Cold water exposure to painful regions helps reduce pain by increasing opioid receptors. Additionally, in pain management of fibromyalgia, hydrotherapy reduces pain, tender points, and improves health and overall well-being. Although water is commonly available and powerful, it is not widely accepted by modern medicine as a mode of improving and restoring health. However, my wish is that the above scientific explanations may strengthen our confidence in this ancient mode of treatment and lead us to apply hydrotherapy methodically and technically when applicable. “And he shewed me a pure river of water of life, clear as crystal, proceeding out of the throne of God and of the Lamb. In the midst of the street of it, and on either side of the river, was there the tree of life, which bare twelve manner of fruits, and yielded her fruit every month: and the leaves of the tree were for the healing of the nations. And there shall be no more curse:” Revelation 22:1-3. Fleming SA, Gutknecht NC. Gutknecht. Naturopathy and the Primary Care Practice. Prim Care. 2010;37:119–36. Ohori T, Nozawa T, Ihori H, Shida T, Sobajima M, Matsuki A, et al. Effect of repeated sauna treatment on exercise tolerance and endothelial function in patients with chronic heart failure. Am J Cardiol. 2012;109:100–4. Versey NG, Halson SL, Dawson BT. Effect of contrast water therapy duration on recovery of running performance. Int J Sports Physiol Perform. 2012;7:130–40. McVeigh JG, McGaughey H, Hall M, Kane P. The effectiveness of hydrotherapy in the management of fibromyalgia syndrome: A systematic review. Rheumatol Int. 2008;29:119–30. A Mooventhan, L Nivethitha N Am J Med Sci. 2014 May;6(5):199-209. doi: 10.4103/1947-2714.132935. Scientific evidence-based effects of hydrotherapy on various systems of the body.